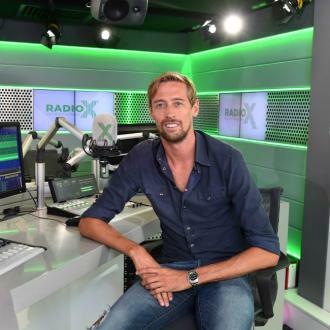 Peter Crouch is to guest present week nights and Sunday afternoons on Radio X for two weeks. Peter Crouch has landed a radio hosting job. The 36-year-old footballer will guest present week nights and Sunday afternoons on Radio X for two weeks, and he has teased fans they can expect some enjoyable stories from him and great co-stars for a fortnight. He said: ''I love Radio X and the music the station plays so I'm excited about being in the hot seat. Crouch will make his debut on the station's 'Radio X Evening Show' on Monday (24.07.17) while filling in for regular host Gordon Smart, who is on holiday. Matt Deverson, managing editor of Radio X, said: ''As well as being one of the best loved footballers of his generation, Peter Crouch is well known for his passion for music and legendary sense of humour. ''He is a huge fan of the music we play on Radio X so I know he's looking forward to entertaining listeners, playing his favourite records as well as revealing a story or two from his incredible career. The former England star - who has two daughters, Sophia, six, and two-year-old Liberty, with wife Abbey Clancy - became known for his Robot celebration in which he used to move his arms around in a rigid motion after he scored a couple of goals for England. He retired his celebration in June 2006 and said he would only do it again if England won the World Cup, but he brought the move back for one match only in January this year while playing for Stoke City when he netted his 100th Premier League goal. Crouch - who is 6'7'' - has played for huge English clubs such as Aston Villa and Tottenham Hotspur throughout his career. During his time at Villa he was often greeted onto the pitch with a chant of, ''There's only one Rodney Trotter'', in reference to him being tall like the 'Only Fools and Horses' sitcom character. The football star has made 42 England appearances, scoring an impressive 22 goals.